Child poet, later a London socialite and gothick author, associate of Mary Shelley, born c1813 , d. unknown. 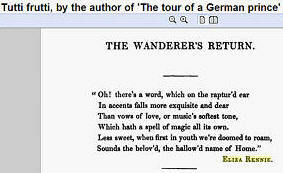 Admir'd by many and adored by him"
Eliza Rennie's first publication was her Poems written as a teenager. Born (most probably) in 1813, she had been writing since at least 1824, and already had some poems published in "different periodical publications" ToC between pages 128-152 . She was encouraged to publish by Thomas Campbell, author of "Pleasures of Hope" amongst others of her father's acquaintances. ToC P120, whilst still in her early teens. "I was seated in my father's drawing room...he asked me to come and see his wife, then in a house in a street leading from the Edgware Road". The Poems greatly impressed some adults at the time, the Monthly Review commenting p 412: "A pleasant little collection", other reviewers were less flattering. A review in the "Gentleman's Magazine" dated June 1828 p. 608 ( see right) comments: "It is one thing to write elegant verses for the amusement of friends or the adornments of albums; it is another to print a volume, and to put in a claim for public approbation". 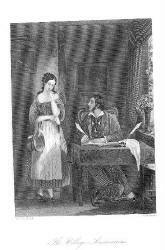 Eliza clearly found the poems embarrassing later, perhaps with some reason. The themes are frequently maudlin, adolescent, and typical of her era: patriotism, death and doomed romance, oriental tales, plentiful imagery of flowers and birds, all very much in the fashionable mainstream romantic and gothick modes of the day. She drew her themes from her difficult start in life, her girlish sentiments and her reading - as a poorly child she read a great deal of good poetry and prose and created (or borrowed) a rich but derivative imaginative world. Yet there are moments when she transcends the genre to come up with something fresh and original - considering her tender years she clearly had great promise and ambition, and not unreasonably attracted some heavyweight support from establishment literary and reformist figures of her day such as Thomas Campbell, a family friend then living "in a street leading from the Edgware Road" and later to become Lord Rector of the University of Glasgow. He was the author of "The Pleasures of Hope" to whom she dedicated her Poems in these terms: "This volume is inscribed with timidity and with every sentiment of respect, by his obliged friend and sincere well-wisher, Eliza Rennie." Which mark'd her from the rest of womankind"
Nor feel remorse when it shall cease! And fans to life each languid flower. In fullest pow'r she shines alone"
Though blight scars branch and spray"
Uncircumscribed, it's limits must decree". Omnipotence o'er all its vigil keeps." In bloom and freshness o'er my mothers grave! Beside the tomb of her - the meek - the good! And dimmed my joyous breast with clouds of care. Like leaves that fade, and fall in autumns day. A home and refuge in my mother grave! Her work was well known, even cited by other authors: Herman Ludwig H Pücklar -Moskau in "Tutti Frutti cites The Wanderers Return. She was a teenaged published poet in London in 1828, and had a modestly successful 32 year career as an author, literary gossip and socialite through to at least 1860, after which she disappears from published records. She sometimes signed herself as "Eliza (beth) Rennie", then after the early 1830's, "Mrs (or Eliza) Walker"
Her father, confidently assumed to be Dr Alexander Home Stirling Rennie, was a distinguished physician with good connections who was educated at Marischal college, Aberdeen, worked in London, and died tragically in a horse riding accident in 1838. There is a single matching reference to a marriage between an Eliza Rennie and a James Walker in Rutherglen, Lanark, Scotland on 14 July 1843, but it is uncertain if this refers to the poet. There is currently no evidence of a long term relationship or children so if this was Eliza the marriage may have been short-lived. One author - Emily W Sunstein, (right) claims that she was born to the famous engineering family Rennie, but this seems improbable and no corroborating evidence has been found. Emily's claim that "the literary Lord Dillon....was said to be Eliza's lover" is very intriguing. Sadly the sources of this gossip are unknown. However Eliza does claim a good deal of intimacy with him, and her account in ToC is both tender and teasing. She claims he died aged 47 but the official record says that he lived from 1777 - 1832. An example of Eliza's inaccuracy. If her lover, he would have been a good 36 years older than her. Relatively little is definitively known of Eliza Rennie - this page is an attempt to encourage scholars and historians to contribute both scholarly material and anecdotal information so that the fragments of biography and the published and unpublished work can be pieced together into a complete narrative. Until recently it was difficult to acquire or read her work - there are few extant copies and those are mainly in London or the USA, though copies do come up from time to time in the antiquarian bookshops and listings, and Google has now published some of her best-known work, including the second volume of ToC . The Rennie family was, and still is, highly respected in Kilsyth, with many branches and relations and a family tree dating back to the C16th. According to records of parish births in Scotland during this period, Elizabeth Rennie was a fairly unusual name. Only one likely matching birth record between 1805 and 1820 can be found of an Elizabeth Rennie who was born on 17th May 1813 in the tiny village of Udny, Aberdeenshire to a father named Alexr Rennie and this gives her mother's name as Jean Taylor. The Minister was known as a kind, enlightened and wise man, though somewhat of a campaigner against "irregular marriages" (Anton). He might have rejected the mother but would not have left his grandchild destitute. He died in 1820 when Eliza was around seven years old. Father: Her true grandparents deaths may also have been the trigger for her to join her father in his Mayfair home, when her father was still in his mid - twenties but already becoming quite successful. The literary evidence that supports this theory is that she describes a 15 year old heroine in "The Widows Daughter" who is much doted on and suffering from poor health, who moves to London as a forced consequence of the death of her fictional father. Dr. Alexander Home Stirling Rennie, born on 13th June 1797 in Kilsyth (1), was Revd Rennie's only son and later became a very gifted and successful society doctor in London. This would place him at just 15 years old when Eliza was born, and her existence is not acknowledged or recorded in the extensive published family tree and history (1) possibly because of the fact that she was born well outwith the parish so there are no local records. . Her father, was, according to Eliza: "a native of Aberdeen, had been educated and taken his degree at the Marischal College there" - ToC P128 - but this may have been carelessness or even a deliberate attempt to conceal evidence, indeed other scholars have described her as "unreliable" (3). Under the circumstances of her unexpected arrival, and given her grandfather's position, a major rift between father and son seems probable, indeed almost inevitable. According to Anton's , Dr Rennie moved to London and according to Anton History of Kilsyth p 161 became physician to William Wilberforce, Rev. Edward Irving, and George Canning. Whilst Eliza does not name her father or his profession specifically, she refers to William Wilberforce, The Duke of Wellington and Rev. Edward Irving as connections of her father, and she appears to have been well-connected with much of the Scottish medical and religious expatriate community in London. In "Traits of Character" she writes: "The position and pursuits of my father having brought me, from early childhood, in communication with many eminent persons, and circumstances in after life having done the same...."
The son appears to have inherited the talent of his father for writing and research. In 1828 Dr Rennie published a scholarly article entitled: "A treatise on Gout, Apoplexy, Paralysis and disorders of the Nervous System". As an expert on gout he would have had no shortage of wealthy clients in the capital in the 1820's and 1830's, such as George Canning, Prime Minister in 1827. Despite the ministrations of Dr Rennie, Canning didn't enjoy good health, and died suddenly in office on 8 August 1827 just 119 days after taking up the post, achieving the dubious record of Britains shortest-lived PM. Mother: Possibly the Jean Taylor, born on 8th June 1798, in nearby Larbert. She may have been a maidservant in the Rennie family home? She would have been nearly 15 when Eliza was born. The poem continues: "To hear her tell of treachery, wrongs, deceit -" strange words for a child of 13 to write - hinting of hidden betrayal and misery. in London: She appears to have suffered poor health as a child, possibly related to anxiety and grief. Dr Rennie may have wanted his natural daughter to move to London where he could monitor her condition amongst the best medical experts of the day, or maybe she was unwelcome in Kilsyth following the death of both her grandparents. Eliza's early writing was encouraged Vol 2 p197 by "the late Vincent Dillon. I had written a few verses about 'sorrows' ...maudlin sentimentality was then in full force and operation and rejoicing in a strong tide of popularity" but later rejected these early outpourings: p198: "otherwise, when I now read these feeble stanzas 'to the Morn' etc which I then perpetrated, I marvel positively how they ever got into print at all: but I daresay I had a certain amount of authorial pride in, and vanity about, them then." The impression we receive of Eliza in London is of a young woman growing up fast in a rather flattering and sophisticated world. She describes going to see Edward Kean, the actor, playing Richard II whilst she was still "very young"...but continues..."Ours was not a play-going family". As a teenage girl she had poor health, Vol 2 p198 "A mutual friend had shown Lord Dillon some of my little verses, and some short tales I had written, which, I think, were a degree better. He praised them far beyond their deservings, offered to give me hints and suggestions, and correct for me my future compositions ; and it was certainly chiefly by the cheering encouragement he gave me that the bias of my pursuits became from thence-forth literary. At that time I had very delicate health, and I think and fear I made it the excuse for being a very idle girl, and being a much petted and spoiled one ; exertion or application of any kind was neither expected nor desired from me, lest illness should supervene ; and I am afraid I wasted some of the most precious years of existence in doing nothing. " Poor health appears to have continued into adulthood, and she later commented of Dr William Lawrence: "but for his talent my career would have long since ended". In 1829, when Eliza was 16, her father married Mary Helen, third daughter of John Anderson of Gladswood. Following the birth of children, in 1834 the family moved from rooms in Mayfair, to Alresford near Winchester in Hants (Hampshire), (Anton) presumably to a larger country house suitable for the growing family. This was a curious career move for an ambitious doctor, as the railway did not arrive in Alresford until the 1860's. However the turnpike built in 1753 (now the A31) provided a steady stream of coaches between the channel ports and London. Possibly he simply grew tired of London life, or took over a profitable country practice. We do not know if Eliza, now 21, moved with the family to Hampshire or remained in London as Mrs Eliza Walker. Maria, his youngest child, was born on 10th Feb 1838. Tragically, he died in a horse-riding accident in 1838, at the peak of his professional career and aged just 40, leaving a wife and young family. This must have been a devastating emotional and financial blow to Eliza, then in her mid-twenties, still unmarried and without independent means. In the halcyon years of her late teens and early twenties in London, she is best remembered as a member of Mary Shelley's literary circle. ToC P103: She describes Mary thus: "In early life she was one of my intimate friends. I was first introduced to her at the home of the late Dr Kitchener. .....Gentleness was ever and always her distinguishing characteristic...many years friendship have never showed me a deviation from it". She strongly defends Lord Byron: P113: against: "wretched slander, vile detraction" and could be quite bitchy about some contemporaries: "Her half-sister I once saw. I certainly felt no little wonderment as to what was the attraction she possessed to win the admiration of Lord Byron"
Whatever the reasons - her father's new marriage in 1829, the household move to the country in 1834, her limited talent, or his untimely death in 1838 in a fall from a horse, Eliza's career as a young writer appears to have been on the wane by the late 1830's. Her early potential as a promising teenage author was largely unfulfilled, possibly writers block, religious conversion or maybe just too giddy a social life. One can only speculate that in her mid-twenties, she was seeking an escape from disappointment in love or career. According to Geraldine Friedman Eliza was "the unreliable writer Rennie, who fictionalizes her memoirs by claiming an intimacy she never had with the celebrity Mary Shelley". This may well be true: her set lived rich fantasy lives and followed the cult of celebrity of which Lord Byron was the supreme example, indulging in continual name-dropping. Nevertheless, she was a moderately successful author:. 'Like most literary misses of that day, I used to write in the "Annuals," considering it quite a distinction for my name to be enrolled with those of the really eminent men and women who then contributed to their pages'. She includes many Scots amongst her character sketches: describing a visit to the "little Scotch church at Cross Street, Hatton Gardens, to hear Edward Irvine (a celebrity preacher) : "having obtained a ticket to see his sermon from a friend of my fathers who was a native of dear old Scotland". Despite being very impressed by his looks and oratory, she describes P83 "the singular delusions of which he in subsequent years became a victim" . (i.e talking in tongues).."many of the congregation were moved by it to loud irreverent laughter". ToC P89 She was opposed to the extremes of revivals but expresses a strong interest in clairvoyance and mesmerism. "Of my father he inquired much. When I told him he had been greatly identified with Wilberforce and others in writing pamphlets, &c, towards the achievement of that great and noble work, the abolition of the slave-trade - ...."
She also describes at one point lodging in a house in "a watering place" so clearly she also travelled outwith London. This may have been Ryde, on the Isle of Wight, (also the fashionable favourite of Queen Victoria) which she describes Vol I p219 as "my favourite watering place". She liked to dance and flirt: "whilst with him as partner through many a mazy waltz and quadrille" She describes coming into some property through a legacy, but whilst there are no references to her husband, she does refer to discussions about fees with one of her publishers. In the last chapter of ToC, Vol 2 p325-326 concerning Mrs Morton, a publisher/editor, she observes favourably on her beauty and appearance: "I am a great admirer of rosy lips. I think fresh crimson lips are things exceedingly to be admired". A marriage is recorded between an Elisabeth (sic) Rennie and a Mr James Walker on 14th July 1843 in Rutherglen, Lanark, Scotland. Rutherglen is not far from Kilsyth - and this may be the point at which Eliza Rennie became Mrs Walker. But this needs more checking. In any event, and for whatever reason, her marriage did not appear to last. In ToC, published in 1860 when she was around 45, she describes life very much as an independent woman, and refers repeatedly to personal tragedies, betrayals and disappointments. No children are ever mentioned, though she had a pet terrier of which she was inordinately fond. Finances may have been as issue, but she describes how "I came into some property through a legacy" ToC between p89 and p 103, and appears to have been reasonably comfortable. An Evening at Dr. Kitchener's in Friendship's Offering; and Winter's Wreath: A Christmas and New Year's Present, for 1842, Mrs. Eliza [Rennie] Walker, ed. Leitch Ritchie (London: Smith, Elder, and Co., 1842) p. 246. 3. Traits of Character; (full text of Vol II now available from Google books) Being Twenty-Five Years' Literary and Personal Recollections, by a Contemporary, Eliza Rennie, 2 volumes (London: Hurst and Blackett, 1860) pp. 2: 207-09. 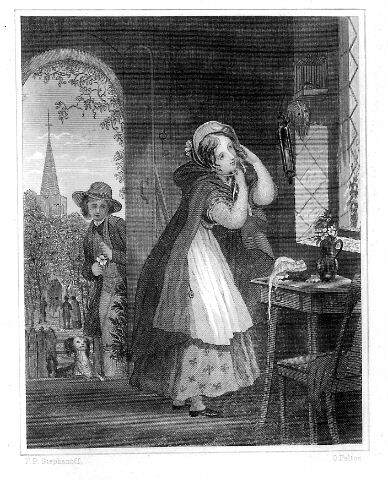 The Widows Daughter in Ladies Gift or Souvenir of Friendship, The; illustrated by Mitford, Mary Russell; Youatt, Elizabeth; Landon, L.E. ; Walker, Eliza; Strickland, Agnes Boston, MA: Phillips, Sampson and Co, ca. 1855. 12 x 19 cm. This is an elegant little book of republished poetry and prose, much of it by well-known women poets and writers of the first half of the nineteenth century. Includes ""The Capucin"" by Mrs. Romer; ""Grace Brown, a sketch for Mothers and Daughters"" by Mrs. D. Clarke; ""The Village Amanuensis"" and ""The Rustic Toilet"" by Mary Russell Mitford; ""The Pawnee's Ransom"" by Georgina C. Munro; ""The Country Tavern"" by James T. Fields; ""White Thorne Farm"" by Miss Agnes Strickland; ""The Postman's Knock"" by Miss Power; ""The Brighton Coach"" by Theodore Hook. Elaborately decorated red leather on boards with gilt floral ornamentation. "Time, faith, and energy, are the three friends God has given the poor." BULWER'S Night and Morning. IT was towards the close of the busying month of April; but, though early in the spring, the weather was bright and bracing ─ one of those days which, from their clear, delicious freshness, give added buoyancy to the step, strength and elasticity to the spirit - when the boon of mere existence is felt as a joy and blessing, and the heart, forgetting the shadows which past grief or impending calamity fling over it, breathes unmixed aspirations of praise and thanksgiving to the Author of all good! How appropriate, then, was a day like this for the long-projected féte at Morton Grange! What was it commemorative of? Were the nuptials of the young and lovely the event celebrated? The birth or majority of an heir recorded thus by joy and festivity? It was neither of these occasions which collected all the elite of ── shire into one focus. It was to mark the recovery from long and dangerous illness of Eva, the only child of the proud and pompous owner of Morton Grange ─ a young, still feeble, ailing girl of fifteen. The successive deaths of five other children, the long period which intervened between the demise of the last of these and the birth of little Eva, had made her to her parents an object, it might be said, almost of idolatry. Such affluence of love was scattered over her path, so fenced in was she by the eager, watchful care of parental affection from the common casualties of peril and danger, that when, despite the vigilance exercised, disease struck her down, and the glad laugh was exchanged for the low wail of anguish, the bright glance dimmed by the films of sickness, the appalled parents started as from a dream. What, then, was she, the only and beloved, whom they had so cherished and caressed, hurrying, like their other little ones, to the dreary grave? There was agony almost to madness in the thought. All that consummate medical skill could effect was rendered; all that ceaseless, unremitting attention accomplish, offered. Heaven was besought with earnest, supplicating importunity, to spare their treasure; and Heaven listened to their prayers! The fever of delirium faded away, and the thin hand pressed once more in recognition the mother’s fervent clasp; the pale lip wreathed into a faint smile on the fond father, who bent breathlessly watching each varying turn of the ashy face. nb: to be continued.....there are another 18 pages of breathless and glorious Gothick melodrama to follow...including a house fire, death, poverty, more ashy faces and a happy marriage for our doughty heroine ! There is probably a significant body of other work yet to be identified in "Literary Annuals": which may have been published, or republished under different names. Here are a few samples, some may be reprints from British annuals. In: The Book of Pearls, a Choice Garland of Prose, Poetry, and Art. and also: The Boudoir Annual, a Christmas, New Year and Birthday Present for 1847. "Literary annuals are early nineteenth-century British texts published yearly from 1822 to 1856 and primarily intended for a middle-class audience (due to their moderate retail cost). Initially published in octavo (3.5" x 5.5") the decoratively-bound volumes – filled with steel plate engravings of nationally-recognized artwork and sentimental poetry and prose – exuded a feminine delicacy which attracted a primarily female readership. They were published in November and sold for the following year (at a cost of between eight shillings and three pounds), which made the genre an ideal Christmas gift, lover’s present or token of friendship. On display in a woman’s drawing room, the annuals became an acceptable indication of propriety, education and wealth, a complement to the limited social definition of a "lady" at the time. The first and only annual published in November 1822, Forget Me Not, caught the eye of several editors and publishers, many of whom altered the format and helped in the creation of a publishing phenomenon. By 1828, 100,000 copies of fifteen separate annuals earned an aggregate retail value of over £70,000 (including the Keepsake, the annual given to Rosamund Vincy in Eliot’s Middlemarch) establishing the genre as a lucrative venture for publishers for years to come." In Pseudonymity, Passing, and Queer Biography: The Case of Mary Diana Dods, Geraldine Friedman explores the extent to which ambiguous sexuality, cross dressing, multiple identities and lesbian tendencies were a key attribute of this set. ". . . I must give you an outline of the doctor's personal appearance. This was very remarkable, stamping him with individuality and originality at least, if it challenged for him no more unfavourable judgment. . . .
. . . his figure, dress, and gait were alike, and altogether most outré. He was tall, bony, angular; his body always looked of most disproportionate and unnatural length—and there was a gaunt, ungainly look about him, which at once arrested your attention. An attack of paralysis, which affected one side, gave to his gait a halting movement almost painful to witness. To the same calamity also, I believe, was attributable the loss of sight in one of his eyes. But this deficiency was not observable, as he wore glasses—of his own invention, by the way. His complexion was dark, but not unhealthy-looking; his features good, and the expression of his indicating shrewdness of mind combined with kindliness of heart. 1. Kilsyth Library - "Rennies of Kilsyth - The History of an Agricultural family" James E Rennie, 1965, privately published T&A Constable, Edinburgh. 4. Cynthia Collier, USA, collector and owner of Eliza's copy book, correspondence. 7 1828 Dr Rennie published a scholarly article entitled: "A treatise on Gout, Apoplexy, Paralysis and disorders of the Nervous System" - London, Burgess and Hill. Henry Augustus Dillon-Lee (1777-1832), who was an Irish peer, writer and MP. by Henry Augustus Dillon-Lee Dillon publisher: Printed for G. and W.B. Whittaker / 1822 / 2 vols (I 274p; II 287p). Corvey; CME 3-628-48097-3; ECB 345; EN2 1822: 29; NSTC 2D13576; OCLC 35663915. ROSALINE DE VERE. IN TWO VOLUMES. Henry Augustus Dillon-Lee, Viscount DILLON 1824. London: Treuttel and Würtz, Treuttel, jun. and Richter, 30 Soho Square, 2 vols (I v, 281p; II 277p) Corvey; CME 3-628-48547-9; ECB 502; EN2 1824: 29; NSTC 2D13577; OCLC 12423730.